50th Wedding Anniversary, November 1, 1985. Mrs. Lones, passed away January 5, 2002.
and will be missed by many family and friends. dedicated this book to her late husband, Homer. and resources from many others in the writing of this book. and I am very grateful to her for allowing me to do so. interested in purchasing a copy you may contact Niota City Hall for pricing. mail and freight between the two towns often being mixed or delayed. Both towns knew something had to be done, but didn't know just what to do. Mossy Creek where it sat on the freight wagon and melted. This was the straw that broke the camel's back! Railroads and asked that Mouse Creek Station be changed. their suggestions. 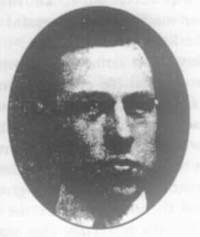 The Stationmaster, James L. Burn, suggested Movilla. He was accustomed to using Morse Code and MO was the call for Mouse Creek. He added villa, and came up with Movilla. an Indian Chief, Nee-o-ta. He put this name in the envelope. he had chosen Mr. Boggess' suggestion and had changed the spelling to Niota. Mouse Creek Station became Niota April 15, 1897.
serving as a member of the State Legislature. that have done wonderful things for Niota and in some cases for the United States. gave women the right to vote. for the counties of McMinn, Monroe, Polk, and Bradley. being only 22 years of age when elected. thirty-six of the forty-eight states before it could become a law. four states were asked to call special sessions and vote on the issue. but Tennessee agreed to do so. This session was called to meet in August 1920.
mother, Febb Ensminger Burn asking him to vote "aye" changed his mind. his vote broke the tie. taught that "a good boy always does what his mother asks him to do." have his mother to thank for raising him with those beliefs. On October 1, 1988 six women were elected to run the city government. Grace Forrester, Nellie Finley, and Boots Snyder were elected as commissioners. The last four named commissioners ran as write-in candidates. None of the women had served before on the city board. was recognized as having the only female board in the country at that time. The earliest all-female board known about was in New Albany, Kansas in 1935. The Niota Depot is the oldest depot left in Tennessee and houses City Hall. It is also used as a community gathering place for special events. Today, Niota is still considered by its' residents to be "Nigh onto Heaven"
and has grown with new homes and businesses.